A series of blog posts mostly based on my undergraduate dissertation. The first post is here and the second here. "[Jurassic Park is] something that I can count on as a kind of standard that I can then work from...We should not be too reliant on the film, but I think journalists often mention JP and other dinosaurs to 1) bring in as broad an audience as possible, and 2) have a bit of fun. Dinosaurs are cultural objects as well as scientific ones, and, for a writer, it is sometimes easier to make a story relevant if there is something like a movie that non-dino nerds will be familiar with." Fair enough really, and it's easy to see why Brian might mention JP in the context of dromaeosaur hunting behaviour, given the pop-culture resonance of the film's super-intelligent creatures. However, he did go on to mention that "if you related everything back to one dinosaur or film, you run the risk of obscuring important details" - in other words, you're going to muddy the science behind the story. For a superlative example of this, one doesn't have to look very far - no further, in fact, than to an old 'friend'. "Scientists now think Steven Spielberg was right in his 1993 film Jurassic Park - meat-eating dinosaurs did hunt at night." Yet another first-class Fail, tellingly authored by 'DAILY MAIL REPORTER' (they might as well adopt the Private Eye gag name 'Phil Space'). What on Earth does a paper on the possible nocturnal habits of dinosaurs (based on scleral ring morphology) have to do with Jurassic Park, and how was Steven Spielberg 'right' exactly (didn't the movie creatures hunt at whatever time of day was convenient for the plot)? It's an abysmal, lazy attempt at getting the reader's attention. One commenter quipped "I'd be really worried about myself on a number of levels if I were able to confuse a stop motion Ceratosaurus with a fur-bikinied Raquel Welch", but that's by-the-by. It seems obvious that this bizarre digression into the realms of 1960s starlets in unlikely swimsuits has been inserted as a bit of a laugh by author Ian Sample (something a quick e-mail exchange confirmed). Call me po-faced, but it seems to me to be an unnecessary diversion into the realm of parody; treating palaeontology as silliness concerning big, dumb movie monsters rather than science of any interest. I'd also question as to whether scientists are really claiming that ceratopsians behaved in a manner reminiscent of fighting off scantily-clad, spear-wielding women (which obviously weren't around in the Mesozoic), as Ian Sample seems to be implying here. Still, maybe I should just lighten up, eh? Coverage about plesiosaurs has its own particular problem - not related to movies, but to a fictitious monster associated with a big lake in Scotland. Ever since the 'Surgeon's Photo' - supposedly depicting an animal with a long neck and tiny head taking a peek from Loch Ness - 'Nessie' has been associated with plesiosaurs. Nowadays we know that plesiosaurs couldn't actually adopt the swan-like pose depicted in the Surgeon's Photo. Still, it doesn't stop the comparisons rolling in. One Mail headline from 2009 declared that Nessie had been found - except long-dead and in Dorset, obviously (nice use of the Surgeon's Photo, too). The article goes on to refer to the plesiosaur as a "marine reptile" while still referencing a "'lake monster'". Seriously, guys, there's a point when you've stretched your silly, tenuous analogy too far. Plesiosaur researcher Adam S Smith explained in an e-mail to me that he didn't mind the occasional reference to Nessie, but has issues with the fictitious creature being "mentioned in [a] context that assumes that [it] exists and is a plesiosaur" - just as in the above quotation. Fortunately, Adam's put together an exhaustive page demolishing every possible notion that plesiosaurs might still be alive - check it out. Still, since these are articles that are obviously based on the same press release - regurgitated in the finest churnalistic tradition - it might be pertinent to include at least one other. So here it is. At least the author has referred to Nessie as being "mythical" in that one - unfortunately, he also refers to a plesiosaur as a "marine dinosaur". Damn. TBC, dodgy BT contractors and other so-called 'real life' distractions permitting. I'm not the first person to recognize the intimate relationship between art and paleontology. One of the great benefits of writing this blog has been meeting artists who inspire me with their craftsmanship, imagination, and dedication to the inherent beauty in biological forms. Even better than that is learning of the surging culture of young paleoartists hashing out their form on-line. Their ability and discipline is humbling and has spurred me on to make a career of visual science communication. 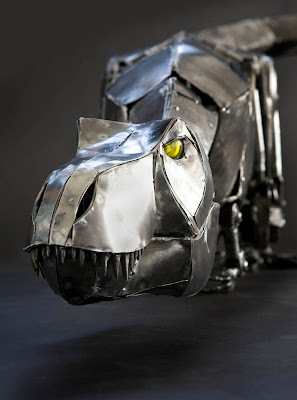 So, when artist Andrew Chase emailed me about his sculpture of Tyrannosaurus rex, my mind was primed to be blown. Here was an artist who recognized the integrity of the tyrant lizard's form. This is something I admire in the greatest paleoart, and it's the reason I harp on scientific accuracy (concerning which, I admit, I still have much to learn). The greater understanding paleontologists have given us - how dinosaurs moved, breathed and inhabited their lost worlds - has resulted in more resonant art. I asked Andrew what drew him, as an artist, to this particular animal. "Tyrannosaurus has a purity of form that I find beautiful," he answered. "In my opinion, the T. rex is basically a mouth delivery device, everything else is subordinate to that. No goofy crests, sails, horns/protrusions for sexual display, for this baby it's all about the head. What's the tail for? To balance the head. Legs? Moving the head to the food. Brain? Overrated, keep it small and you can make the jaws bigger. Arms? Not necessary, lose 'em (well almost) and increase the size of the head. I think that singular dedication of purpose is maladaptive but really, really cool." I told Andrew I was especially impressed that he had consulted with the University of Utah's Dr. Mark Loewen when conceiving his sculpture, and I knew that many readers would appreciate it, as well. He said, "I don't know why anybody doing this sort of project wouldn't consult with an expert. I'd be insane not to. There's literally no downside. 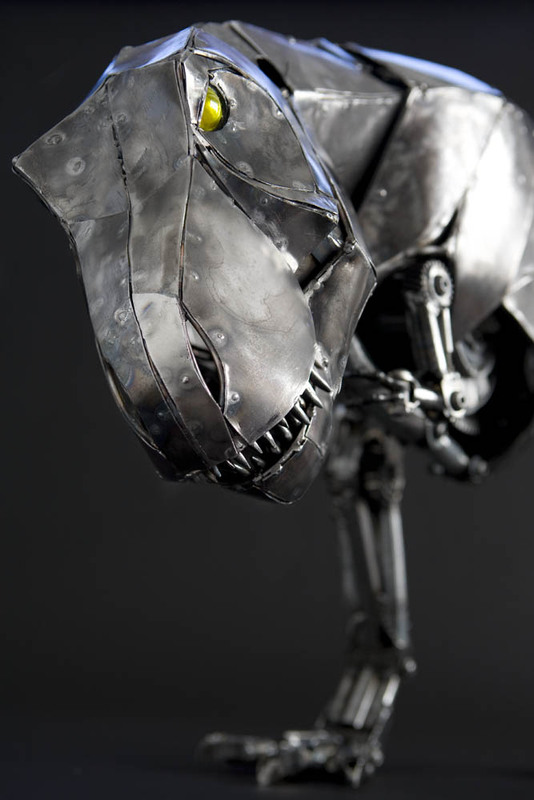 I've made six animal sculptures so far and I've found that the closer I adhere to the animal's real physiology, the better the outcome. When I make a strong effort to be accurate, the pieces are better balanced, pose more easily, and are generally superior in every way to the one sculpture where I just eyeballed it." Andrew's T. rex is six feet long, stands two feet at the hip, and weighs about forty pounds. 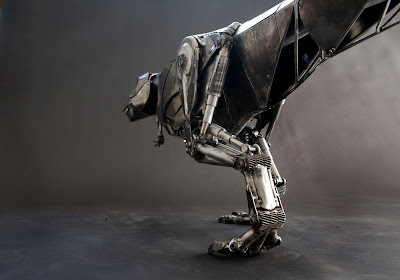 It is fully articulated, as are his other animal sculptures, and he says that it's "made primarily out of recycled transmission parts, conduit, plumbing pipe and unidentifiable widgets found in industrial salvage yards." The genesis of the sculpture was Andrew's yet-unpublished children's book, Timmy, a lonely robot tale - written and created before Wall-E - in which he says that "the Tyrannosaurus is a metal shredder, compactor and waste disposal unit. Everything and everyone will eventually pass through him. Because of this, the poor T. rex suffers the plight of undertakers everywhere and leads a somewhat lonely existence, even though he's witty, urbane, and would never intentionally eat a functioning machine." Please head over to Andrew Chase's website to check out more of his art, including some stunning work from Timmy. Today's entry in the hallowed Vintage Dinosaur Art series, brought to you by the kindness of Terry Thielen who uploaded the scans to Flickr, is Lost in Dinosaur World. This is the second book in the four-part Dinosaur World series by Geoffrey T. Williams, but is the only one illustrated by Borje Svensson. Unlike so many of the books featured in these posts, this series has an honest-to-gosh website dedicated to it. Most intriguingly, there was a direct-to-video movie made from the series in 1993, with creatures by Dinamation. The stills on the site make me mighty curious to see it (especially this one). But that's for another day, hopefully. Our plate is full with Svensson's whimsical illustrations. 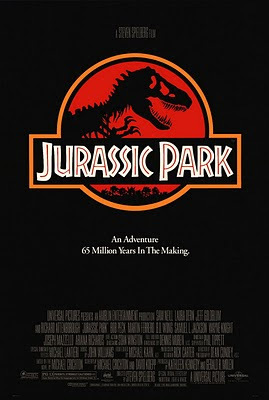 Having established the Dinosaur World concept in the first book, Williams jumps right in, with a young boy named Tim and his family visiting the park. I'm not quite sure how the Dinosaur World park came about in the story, but it does predate Crichton's Jurassic Park by a few years; Williams even tried to sue Crichton in 1996 (also see this PDF). Yet another wrinkle that threatens to overshadow Svensson's work, so instead let's look at that, shall we? It begins with rather standard depictions of pterosaurs, though the large size difference between the background Pteranodons and the rhamphorynchid in the foreground doesn't really come across. Refreshingly, Svensson depicts Parasaurolophus with the correct posture, and as the main character feeds a juvenile, you can tell that it's rearing up from being on all fours. The distinctive crest could certainly be reduced in size and other proportions could be changed to make the animal look more juvenile, but overall it's a good mid-eighties take on the popular hadrosaur. T. rex storms into the idyllic scene, rudely interrupting the bonding between boy and duckbill. It's got a bit of potbelly syndrome, but again the posture corrects the old man-in-suit trope that stuck around for so long. The head seems small, and there's one too many digits on those hands, but it's a decent stab at the beast for a children's book of the period. Though I believe, thanks to Marc, that this tyrannosaur would be in a tremendous amount of pain if its leg was actually extended in that way. The coolest part of the book is the T. rex Express, a totally badass train by which visitors can safely move around Dinosaur World. The locomotive is styled like a great robotic tyrannosaur, and I am crossing my fingers that the creators of my favorite PBS Kids series don't find themselves on the business end of a lawsuit. Oddly humanoid hands on the express, aren't they? 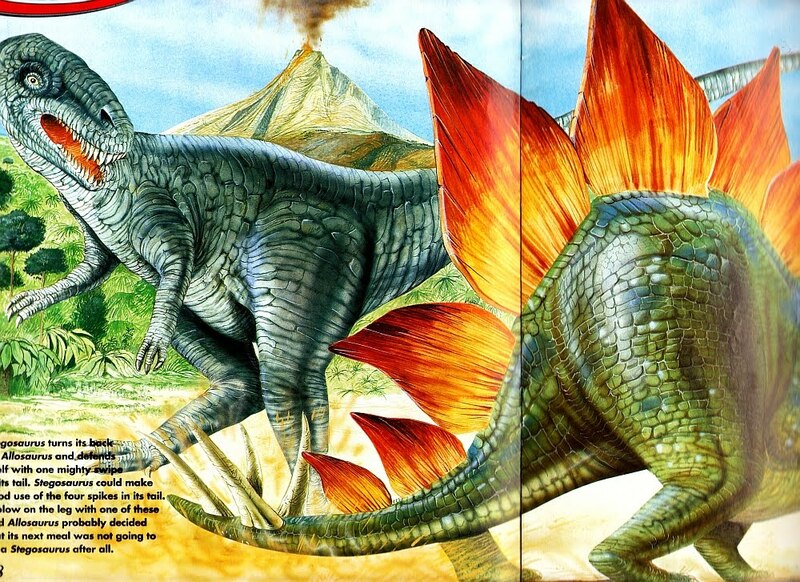 For more from this title, head to the Vintage Dinosaur Art pool to see more of Thielen's scans. He also shared Bronto the Dinosaur with the group, which I featured here in May. Thanks again, Terry! 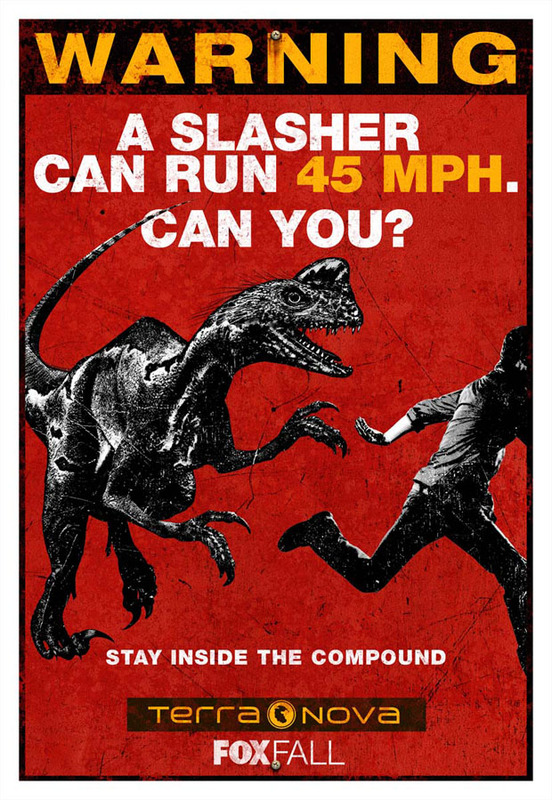 Beware of the slashers! The upcoming Fox series Terra Nova, set to premiere on September 26 in the US, has released a series of promotional posters, giving us the first good look at the dinosaurs in the series. The clearest one shows a dude being chased by an odd dromaeosaurish thing. So, there it is. A bit of unfortunate Bunny Hands Syndrome, the barest hint of feathery stuff about its head, and an odd crest that doesn't quite fit any dromaeosaur I'm aware of. I'd love to see the first two changed, but because of the spottiness of the fossil record, I don't have a problem with invented dinosaurs for the series, as long as it's done well. Most importantly: will I give a darn about the characters? We'll see. I'm not sticking around for CGI dinosaurs if the people drive me crazy. More of these from the Hollywood Reporter. ...performed a real palaeo-autopsy on the soft tissues of the specimen, that revealed anatomical details never seen before in a dinosaur. Through ultraviolet-induced fluorescence photography, computed tomography and scanning electron microscopy coupled with element microanalysis, Dal Sasso & Maganuco demonstrated that the soft tissues of Scipionyx are exceptionally preserved even at cellular and subcellular levels - to a point that, after 110 million years, an unrivalled variety of biological structures can be seen in a single fossil. Read more from the Museum of Natural History in Milano. Naturally, Italian Andrea Cau has been writing much about it at Theropoda. Analyzing the teeth of three different sauropod genera, John Eiler of Caltech has provided evidence of endothermy in sauropods. Of course, mammal-like body temperature in a sauropod may be due to gigantothermy, so it will be lovely to see the method applied to other critters. Read more from Nobu Tamura at Paleoexhibit, ScienceNOW, Livescience, and even USA Today. Last week, I was remiss in not including a fine post from David Tana at Superoceras, discussing the recent auctioning off of the "fighting pair," an Allosaurus and Stegosaurus. He asks some pointed questions about the whole affair and about how the auction was marketed to the public. Anthony Maltese describes the rescue of a nearly poached specimen of the predatory Cretaceous fish Protosphyraena perniciosa, found partially excavated in the Niobrara chalk of Kansas. 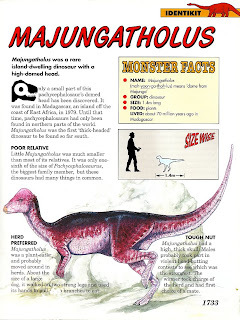 Those pesky iguanodonts pop up at Paleo Illustrata, and Stu Pond shares an illustration of Mantellisaurus atherfieldensis. The genus Darwinopterus has a sensation among pterosaur fans. At Archosaur Musings, Dave Hone shares a photo of a D. robustodens fossil and talks about the mad rush of similar material coming out of China. Taylor also discusses the new pterosaur at Life as we Know it. Albertonykus continues to provide illuminating posts about the feathers of maniraptors, and how many of our visions of them might fall short of reality by a long shot. A diagram of an owl in the latest part of the series is especially illustrative of just how dramatically feathers can affect the shape of an animal. At Faster Times, Asher Elbein recalls the 90's video game Primal Rage. "Its characters bit, smacked, clawed, and tore bloody chucks from each other, in addition to a variety of special attacks that ranged from the predictable (super powered bite) to the gag inducing (acidic golden showers.) There was something of an uproar when parents discovered that not only were the dinosaur attacks exceedingly visceral, but other unpleasant bodily fluids were involved." Jeez, I need to play this one again! Susan of Crurotarsi chronicles her trip to Arizona to do research at Petrified Forest, providing photos of the lucky Postosuchus who gets to make the road trip with her. Andy Farke writes about the quest to work out the disparity of ornithischian dinosaurs with the Open Dinosaur Project. Disparity "is the measure of how different species are from each other in terms of shape, size, or other discrete features (not the same as diversity, which just counts how many different species exist," he explains, and points us to a piece by Randall Irmis for a bit more education. Tinamous may be an indicator of how oviraptorids and troodontids brooded, speculates Jason Brougham at his blog. Stuff I shared on Twitter in the last week or so. Tree of Life review: "Daddy didn't love me. Hey look, a dinosaur!" I love Newsradio, but this excessively 'shopped promo image is terrifying. 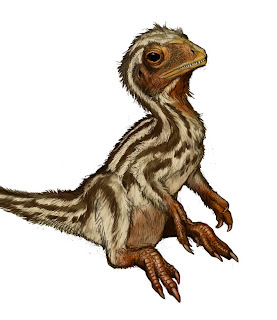 Jaime Headden on the mysterious "Ronaldoraptor"
One of the questions in the Dino Gangs live chat I took part in this week was whether Mesozoic dinosaurs may have used tools, as their cousins the crows and parrots can today. Who knows? But here's a bit of playful speculation along those lines from Deviantartist Psithyrus. Illustration by Psithyrus at DeviantArt. Cleverbot is "an AI web application that learns how to mimic human conversations by communicating with humans," as Wikipedia states it. 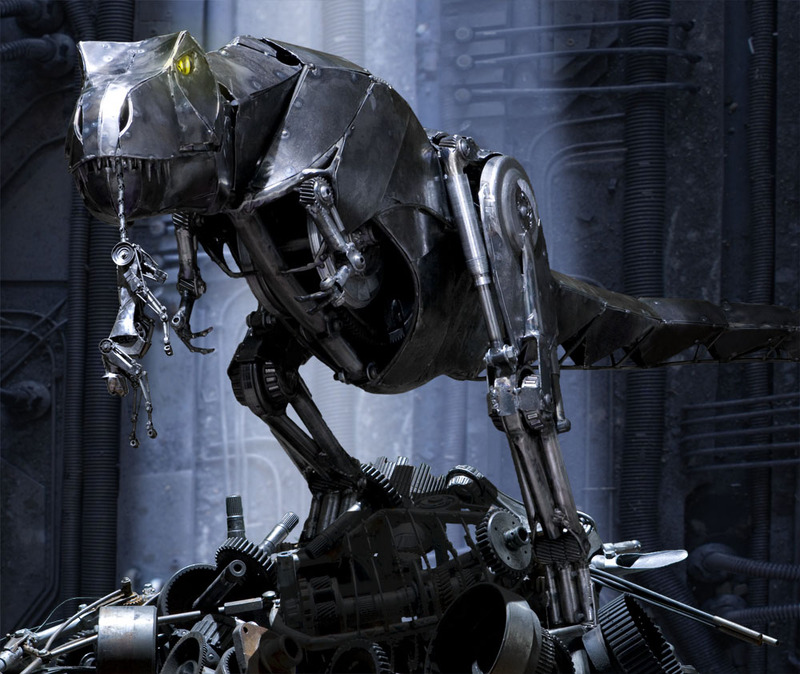 Wondering just what an AI web application might think about dinosaurs, I decided to have a bit of a chat with it. This is what happened (sorry for the weird faded bits, didn't realize that until I started stitching screencaps together). Essentials first - it'll cost you £10 to get in, or £6 for concessions (including kids and students, or people whose student IDs haven't expired yet - hurrah). Photography is apparently prohibited, although they only told me that on my second visit, so (as you have seen) I do have photos from the first time around. Sorry, Natural History Museum. Please don't send me any threatening letters...I love you really. Obviously the life-size animatronics are the main draw, and I'll get back to those - but there's a preamble with plenty of interesting specimens/casts on show, some of which NHM veterans/nerds may recognise as having been dug out of storage (Protoceratops skull below). Alongside any number of ammonite, fish and plant fossils - which unfortunately I lacked the foresight to take pictures of first time, and was thwarted in doing second time - sits this curious Tyrannosaurus cranium half (below). It's obviously from the museum's former half-a-Tyrannosaurus wall-mount, which Darren Naish has looked at over at Tetrapod Zoology (incidentally the partially-reconstructed mandible, part of the original "Dynamosaurus" material, is now on display in the regular dinosaur gallery). Let's chat about Dino Gangs! Pack hunting, piggy-backing tarbos? Photo by Justine Retsnimel, via Flickr. Discovery Channel UK premieres a new special, based on the theories of Canadian paleontology legend Dr. Phil Currie, on Sunday, June 26 at 9PM. Dino Gangs explores the idea that the massive Asian tryrannosaur Tarbosaurus hunted in packs. He's previously suggested this behavior for the smaller North American tyrant Albertosaurus, and both hypotheses are based on mass burials. It's a dramatic image to conjure, but like Brian Switek, I'm not sure that the evidence supports it. If you'd like to chat about Currie's ideas, join myself, Brian, and possibly one or two other web science writers tomorrow at 1PM GMT (that's an early 8AM for eastern standard time folks like me) for a chat at the Discovery UK Facebook page. Tangentially related toy dinosaur photo by RDL, via Flickr. Included, as Marc would say, "'cos I need piccy." Just in case you weren't aware, new LITC writer Marc Vincent has also been writing for the Dinosaur Toy Blog for a while. Even though I'm not much of a collector, the DTB is one of my favorite blogs to check out, dealing with toys ranging from stunning achievements of true artistry to "beaten with the ugly stick." Reviewing figures for dinosaur geeks naturally involves critiquing scientific accuracy, so you get some educational value, too. Folks seem delighted by the mere fact of DTB's existence; when I recently tweeted a link to a review, it got a surprised "there's a blog for everything!" reaction. Check out Marc's recent reviews of figures of Ankylosaurus and Torosaurus. Not that Marc's the only quality writer there, but you know. I'm obligated to crow louder for him. The pot-bellied tyrannosaur. Theropods gnawing on sauropod necks. Sauropods half submerged in murky water. Plesiosaurs gadding about with their necks exposed above the water. Paleoart has many classic tropes, and today's Vintage Dinosaur Art features one of my favorites: the bird-hunting Ornitholestes. The line between trope and outright thievery is a bit fuzzy, though. It all began with Charles R. Knight's original restoration for Henry Fairfield Osborn. The Charles. R. Knight Ornitholestes. Shared by Trish Arnold at Flickr. The appeal of Knight's drawing is understandable: arriving as it did in the middle of the time when dinosaurs were supposed to be tail-dragging dullards, here is a small, lively creature that Osborn initially described as perfectly adapted for hunting birds. Although his position on the matter changed, and not much work has been done subsequently, the work done by Knight was hugely influential. Dinosaur books for the rest of the century would feature the primitive maniraptor. As I've been collecting old dinosaur books, and as others have shared them with the Vintage Dinosaur Art pool, it's been fun to see where variations on the Knight original pop up. 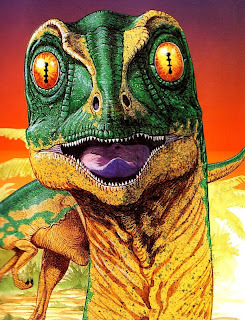 Mort Künstler's version, from 1974's Dinosaur Story, mirrors Knight's composition, and other than some cosmetic changes like a stouter skull profile, is one of the most blatant knockoffs out there. 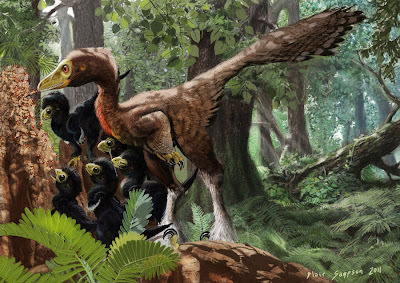 Künstler did, however, partially redeem himself by portraying a different idea about Ornitholestes' behavior, in this illustration of a raid on another dinosaur's nest. Lewis Zacks closely followed Knight, too, in Day of the Dinosaur. No bird, but you know what he was referencing when he drew this. In Day of the Dinosaur, also shared by Trish at Flickr, this unknown artist changed the posture and swapped an insect for the Archaeopteryx of the original. In that, he or she made an improvement. We can safely assume that Ornitholestes shared its environment with a bug of this sort, while Archaeopteryx lived halfway around the world. In What Dinosaur Is It?, Anna Pistorius slams us with a double dose of paleoart clichés: the swamp-bound sauropod and, yes, our diminutive theropod chasing after a gaily colored bird. Peter Zallinger, son of Rudolf, also couldn't resist the urge to sic Ornitholestes after Archaeopteryx. Mirrored like Künstler's, this is another one that almost looks like it could have been traced from Knight. Zallinger does give the Jurassic bird a bit of backup and a longer head start, though. The brothers Hildebrandt tackled the Mesozoic in 1976. Ornitholestes. Archaeopteryx. You get the point by now. We'll wrap up with Aliki Brandenberg's much-cartoonified take on the meme, which pairs Ornitholestes with that other falsely accused theropod thief, Oviraptor - thought if it wasn't labeled as such, you'd think she was doing what Künstler did above, depicting another take on Ornitholestes' feeding habits. But no, that's supposed to be Oviraptor. Got more of these in your own collection? Scan them and upload them to the flickr pool! We're all counting on you. Apparently, there once lived a spinosaur in Australia. If this pans out, and we'll have to wait for a formal description of the vertebra to see if it does, it will greatly increase the range of spinosaurids before pangaea's dissolution. Fellow LITC blogger Marc Vincent wrote about the way the story was botched by the Daily Fail. Also read Brian Switek's blurb about it at ScienceNOW and the coverage at LiveScience. The new edition of the journal Acta Geologica Sinica includes the description of a new species of Darwinopterus, D. robustodens, based on a complete specimen that dramatically increases our knowledge about the genus. Brian Switek has been doing some dino-tourism in his new home state of Utah, and today at Dinosaur Tracking, he shares his visit to the College of Eastern Utah's Prehistoric Museum, home of the massive limb of the nodosaur Peloroplites. ART Evolved points us to the group blog DrawBridge, which has featured some fine dinosaur cartoons and artwork. Raptormaniacs has been featuring informative posts about dinosaurs and feathers. Check out all three posts from this week: one, two, and three. Excellent stuff from the mysterious Albertonykus. At his blog, AMNH Senior Principal Preparator Jason Brougham also wrote about feathers this week, helping sort out just how fluffy feathered non-avian dinosaurs may have been. Jurassic Journeys blogger Dr. Matt Bonnan calls attention to his new YouTube channel, which is shaping up to be a wealth of information for curious seekers of paleo knowledge. Here's his video about deep time, cleverly using his class's rail trip from Illinois to Utah as a scale. Ichnology guru Tony Martin also uses video in his post this week at The Great Cretaceous Walk, The Dinosaur Tracks of Western Australia May Go Extinct. After describing dinosaur tracks around Broome, he shares the news that the area may be endangered by a new Liquefied Natural Gas processing plant. The students of the Montana State University expedition to China also had dino tracks on their mind, braving the dangers of a landfill to see what they could find. The MSU crew has also been added to the SciAm Expeditions blog. Ryan North, creator of the popular Dinosaur Comics webcomic, was interviewed at Dinosaur Tracking. Mark Wildman writes about the limb morphology and ontogeny of plesiosaurs at Saurian, inspired by some new plesiosaur fossils that are proving difficult to identify. Scott Hartman is back with more good material on the Skeletal Drawing blog, and this week wrote about the distinction between Schematic and Realistic skeletal diagrams. Darren Naish declares Lurdusaurus the "stupidest looking Iguanodont." Cool class class from Brooklyn Brainery, Dinosaurs: Myths and Legends. All full, too! +1 for linking to LITC. “Did man tame the Dinosaur?” Fate Magazine, February/ March 1952. Shared by uk vintage at Flickr. For Edward Drinker Cope fans, Ville Sinkkonen's dashing portrait. 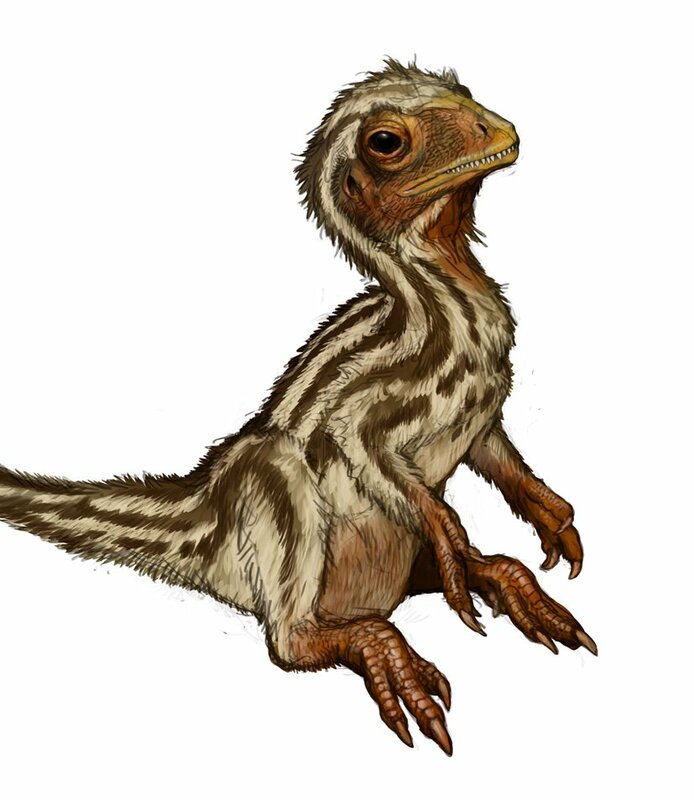 Shared recently at the paleoart blog Dino-Art (not to be confused with Andrey Atuchin's similarly-named personal blog), here's MC Barrett's excellent rendering of a baby dromaeosaur. If you don't read the blog Science-Based Medicine, you should give it a shot. This recent post by Dr. David Gorski on the "cleansing" fad is typically on-the-mark. A series of blog posts mostly based on my undergraduate dissertation. The first part is here. Before beginning proper, I'd like to interrupt this blog to draw your attention to the latest abysmal article to splatter forth from the Daily Mail's foul-smelling electronic sphincter – concerning the probable Australian spinosaur vertebra. Brace yourselves, for now both Tyrannosaurus rex and a Baryonyx species have been discovered in Australia, and Baryonyx outsized T. rex in spite of the fact that (like other spinosaurs, apparently) it had a “small skull”. 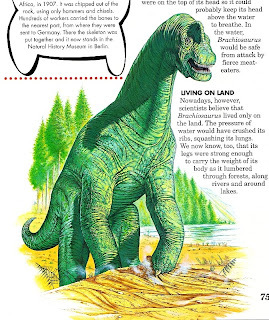 Of course, the lone vertebra has not been assigned to Baryonyx, as confirmed by a quote from Paul Barrett later in the article (and the article therefore contradicts itself). Robo-Baryonyx at the Natural History Museum by Ballista, via Wikipedia, below. 'Cos I need a piccy. "We are not doing our jobs if we simply refer every sharp-toothed dinosaur to the tyrant family because Tyrannosaurus provides a solid hook. If we fall victim to this trope, we perpetuate a cycle in which no one will understand what an alvarezsaur is because we never explain it and we never explain it because we don't think anyone will understand." I completely agree, and might add that this leaning on a few archetypal dinosaurs dramatically understates dinosaur diversity and perpetuates an outdated concept of the true nature of dinosaurs among the general public. More than this, categorically stating 'X is the ancestor of Y', as some writers do, is not over-simplifying but plain wrong - there is simply no way of knowing for certain. A good example of this is a Telegraph article from January entitled 'Pint-sized ancestor of Tyrannosaurus rex discovered in Argentina' - concerning the theropod Eodromaeus. "The creature is not a close relative of modern crocodiles, but belonged to a successful sidebranch of the lineage..."
At once the reader is given a completely different picture of crocodylian evolution than that presented by Alleyne, and a more accurate one, too. Adding in this detail is not only truer to the science, but - I would argue - also adds interest to the piece and educates the casual reader. An additional problem of over-simplification - or 'being patronising' as it should occasionally be called - is that it creates a parody of the work that scientists do. In Bad Science, Ben Goldacre refers to a 'parody of science' created by journalists, and notes that unlike the science pages, the sports, financial and literary sections aren't simplified (or at least, certainly to nowhere near the same extent). There seems to be an attitude that readers need 'shielding' from the hard stuff that they might not understand. But surely if a reader is interested in an article about a prehistoric animal at all, then they're going to want to know the truth and at least some of the hard science behind the story? Science writing, when done properly, should not jettison highly important intricacies for the sake of a more rollicking read. As David Hone has noted here, "most people get their science from the traditional media" in spite of the rise of alternatives. Certainly, while specialist online sites and blogs are a fantastic resource today, casual readers will not necessarily be seeking them out, but rather will take in their science journalism as part of their wider news reading. Therefore, as Dr Hone put it to me, "if [palaeontology] is there, it should be covered properly". In the first half of this post, I wrote about the shaky relationship between cryptozoological research and science, as well as the way creationism worms its way into the equation. I also introduced John Goertzen's paper The Rhamphorhynchoid Pterosaur Scaphognathus crassirostris: A "Living Fossil" Until the 17th Century. Today, we'll dig into it and look at the evidence presented. For those allergic to the metric system, the wingspan came to about three feet, making the animal about the size of your average hawk. The head was about four inches long. It's highly likely that Scaphognathus bore a covering of the hair-like structures called pycnofibers, as the closely related Sordes has been found to possess them (and it's likely that all pterosaurs did). Like their cousins the dinosaurs, where pterosaurs were once believed to have been lizard-like creatures, new discoveries and technological advancements have revealed them to be unique creatures not like anything that we share the Earth with today. The S. crassirostris holotype. From my Flickr set dedicated to the beastie. Because the S. is the only rhamphorhynchoid pterosaur with a head crest, ancient artifacts enable us to tell what the soft tissue of the head crest looked like and identify ancient S. representations with a high degree of confidence. Despite putting on a crisp white lab coat labeled "scientist" in the paper's opening, he's just given up all pretense to rational thought. It's irresponsible to imply that the head crest of Scaphognathus has been confirmed beyond a shadow of a doubt. It hasn't. As Palaeocritti's page on the pterosaur states, there "is no direct evidence of a crest like the one shown on the illustration below, and this is merely inferred from the presence of a flange of bone above the anterior portion of the rostrum which might have supported a fleshy crest," similarly stated in Buffetaut and Mazin's Evolution and Palaeobiology of Pterosaurs. The Dmitri Bogdanov illustration shared at Palaeocritti is included below for reference. Illustration by Dmitri Bogdanov, via Wikipedia. I need to stress that the methodology of Paleocryptozoology is not necessarily to find artifacts that look like modern reconstructions of scientists based on fossils. Indeed, that may be helpful and there may be some accuracy with some of the scientific reconstructions. However, the best method for success is to search for distinct morphological features that are difficult to explain by any other means than that a particular fossil species was observed and accurately described or depicted by its witnesses. An example of a distinct morphological feature is the tail vane of some rhamphorhynchoid pterosaurs. Also, it could be a distinctive skull like that of a Dimorphodon. ...For the S., the distinctive feature is a rhamphorhynchoid pterosaur with a head crest. The S. is the only long-tailed pterosaur presently known from the fossil record with that feature. That will be examined in the present study. I can clear a wider path for Goertzen, but he's already committed to a pretty narrow one. He sees a crested Scaphognathus in all sorts of odd places, including both written accounts and visual representations on seals, coins, and maps. Beyond a basic description of a reptilian creature with wings and a head crest (with no pycnofibers, it must be noted), the descriptions and drawings vary so widely that only wishful thinking can cobble them into a single, consistent creature. Of course, this is the sort of thing a biblical literalist is adept at. Goertzen sees crude images of Scaphognathus on a Roman coin, but the image provided is so low resolution, it's as if he's trying to make the reader work to make out a pterosaurian form in the squiggles and blotches. Luckily, over the years better versions have been made available, such as the one on page 181 of Wayne Sayles' Ancient Coin Collecting IV. The two serpents pulling a chariot sure don't look like Scaphognathus to me. He correctly identifies the driver of the chariot as Triptolemus, a mythological figure. Certainly, this mythological figure might employ steeds with an similar founding in mythology? Or is it more likely that the ancients employed a hawk-sized pterosaur as a draft animal? On a 1622 German coin, a knight on a horse overpowers a creature that looks like a dragon/ griffin half-breed. Again, it's too large for Scaphognathus. And only a feat of imagination can make it resemble one. Worse yet, two plum chances to make a joke about a pterosaur on a coin sail right by Goertzen. Brother, can you spare a Dimorphodon? The Egyptian seal he provides doesn't fare much better, and the quality of the image is even worse than the Roman coin. Again, there's the problem of the alleged Scaphognathus engaging in an activity it's probably not suited for. This time, hunting a gazelle. A line drawing is supposed to clear up the matter, but's kind of useless. I personally see a hot dog stand, but my worldview doesn't depend on hot dog stands in ancient Rome, so I'll probably not bother with putting up a website devoted to it. Goertzen provides two 15th century maps which supposedly bear illustrations of Scaphognathus, the 1435 Borgia map and the 1457 Genoese map. Dragons aren't exactly unprecedented in ancient maps; and the Wikipedia article linked here includes an inscription that Goertzen omits. Above a dragon in Asia, a Latin inscription states, "Here there are even men who have large four-foot horns, and there are even serpents so large that they could eat an ox whole." Goertzen seems to take ancient historians and other writers at their word, believing their accounts to be reliable. It's not the sturdiest foundation on which to base what claims to be a rigorous academic essay. The last form of visual record provided are two sketches of dragons. Goertzen relays the story of the dragon of St. Radegonde, "The Grand Goule," which the second of them is supposed to depict. "This had been encountered previously by those who worked in the monastery. and that monster devoured the monks who, too imprudently, approached its privacy." Now, Scaphognathus is large enough to devour monks. There were certainly large pterosaurs. But Scaphognathus wasn't one of them. "...winged serpents, small in size, and various in form, guard the trees that bear frankincense, a great number around each tree. These are the same serpents that invade Egypt..."
"...a small serpent, as long as a palm branch, and thick like a small finger. It has a small piece of skin, like a crest, on its head and, in the middle of the back, two scales placed on one side and the other which serve as wings in order to advance more quickly"
"...a cruel kind of serpent, not past four feet long and as thick as a man's arm out of whose sides grow wings much like unto gristles"
"...Serpents with wings... they had two legs and small wings so that they could scarce fly. The head was little and like to the head of a serpent. Their color was bright and they were without hair or feathers..."
"...winged and flying serpents that can be found who are venomous, who snort, and are savage and kill with pain worse than fire..."
"...serpents who are very degenerate and, just as it becomes evening, they fly rising over the land, and rest on the end of their tail, rapidly going into motion." Even if all of the accounts were consistent - which, despite Goertzen's insistence, they are not - it's more parsimonious to guess that an extant animal explains the sightings of "flying reptiles," and folk legend accounts for their more fearsome aspects. Intriguing stories, but without some sort of physical remains, we just don't know what these animals, with their diverse behaviors, actually were. As I wrote yesterday, I would flip my lid if a living pterosaur was found to exist, but I have to be acutely skeptical of any hypothesis that a large terrestrial vertebrate known only from fossils has survived into the modern day. The scientific evidence of Earth's deep history is overwhelming, and science has established itself as the most reliable way we have to understand the world around us. While people who don't like what science reveals about the world paint it as nothing more than an alternate religion, science does not rely upon faith. What opponents of science brand as faith is actually trust: trust earned by scientists working within a refined system of rational inquiry, strengthened by competition between researchers with differing hypotheses, manifest in technology. What Goertzen's up to here... it's not science. As someone who does not believe that faith is a path to truth, I find it difficult to don the shoes of a young-earther. If these dragons are supposed to have been living, breathing animals, are we to assume that every mythological creature the thinking ape has invented once walked the Earth, swam the seas, or terrorized the skies? What kind of soul-sucking enterprise is that? Excuse the hyperbole, but in my opinion it's a form of self-hatred, denying humanity its imaginative capacity. Ancient artists and writers are reduced to mere chroniclers of their surroundings, bankrupt of the creativity of invention. As the excellent Bible critic Robert M. Price writes, literalism is a "hollow mockery of the old fundamentalist preaching of the gospel of grace." The sort of literalism Goertzen employs when looking at his "evidence" is, to me, a hollow mockery of mythology. And lest you should be mistaken about whether he's a literalist, read the conclusion of the paper, in which he states that "Pterosaurs were very likely preserved on Noah's ark and survived in Egypt and Europe (and probably elsewhere) until recent times." It's telling that the title of Goertzen's essay includes the phrase "until the 17th Century," roughly when the age of global exploration and the Enlightenment began. Could it be that the true cause of these cryptids' demise was the clearer vision of the natural world given to us by science? In that case, the last place for the living pterosaur to hide is in the murky fringes of our imaginations. 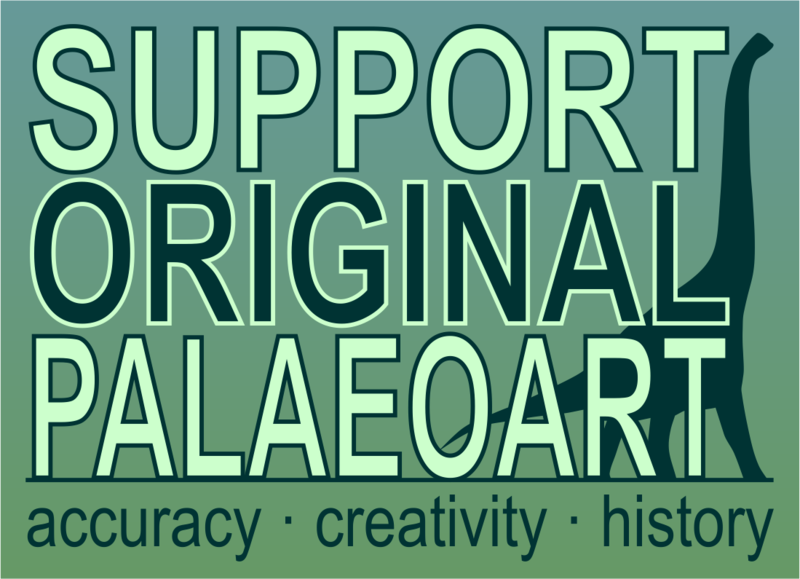 Massive thanks to Michael Barton, blogger at The Dispersal of Darwin, for helping me access a copy of Adrienne Mayor's Paleocryptozoology: A Call for Collaboration, allowing me to write this. Scaphognathus crassirostris: A Pterosaur in the Historical Record? Cryptozoology, the study of animals whose existence is not yet proven, has a checkered history when it comes to scientific rigor. While some researchers go about the task with due skepticism, the field also attracts a less reputable element. Some are hoaxers, plain and simple. Some are hopeful believers whose wishes and biases color their perceptions. Some bear a grudge against scientific institutions. Because of all of this, the standing of cryptozoology among scientific disciplines continues to be a heated topic. The prominence of the Mesozoic bestiary in the popular imagination has naturally spawned legends of extant dinosaurs and pterosaurs. On the dinosaur side of the archosaur family, the Mokele-Mbembe is alleged to be a sauropod who lives in the Congo River basin. Playing for Team Pterosaur is the Ropen of Papua New Guinea. These stories are then seized upon by creationists in efforts to show that the history of life on Earth as reckoned by science is wrong. One of my favorite venues for responsible discussion about cryptozoology is the Skeptic Magazine podcast MonsterTalk, hosted by Blake Smith with co-hosts Ben Radford, and Dr. Karen Stollznow. Dr Darren Naish joined them for a 2010 episode to share his perspective on the subject of today's post, extant pterosaurs. Speaking about how he and his fellow paleontologists often find themselves on the "front line" of the creationist attack on science, Naish describes a typical encounter with a creationist. Considering paleontology to be an easy target, they'll begin by discussing reconstructions of dinosaurs, springboarding to pick apart perceived weaknesses in the scientific conception of the geological history of the Earth, evolution, and cosmology. This bears out in the creationist museums, which sidestep the overwhelming evolutionary evidence presented by, say, genetics, instead emphasizing the importance of faith and simplistic dioramas of dinosaurs and humans living together. These are designed to play off our inherent difficulty in grappling with deep time: "Millions of years? Get out of here!" By offering a story in which long-extinct creatures exist during recorded history, cryptozoology is seen to be a sword that finds the chinks in paleontology's armor. In another episode of MonsterTalk from 2009, Dr. David Martill puts it well: "Even if a pterosaur did [survive the K-Pg extinction], it wouldn't alter a jot our perceptions about evolution, or the age of the earth, or any of our scientific philosophies that paleontology has helped develop." There's never been a clear justification for how a "living fossil" undermines the theory of evolution, but still, some creationists seem to be obsessed with this false dilemma. 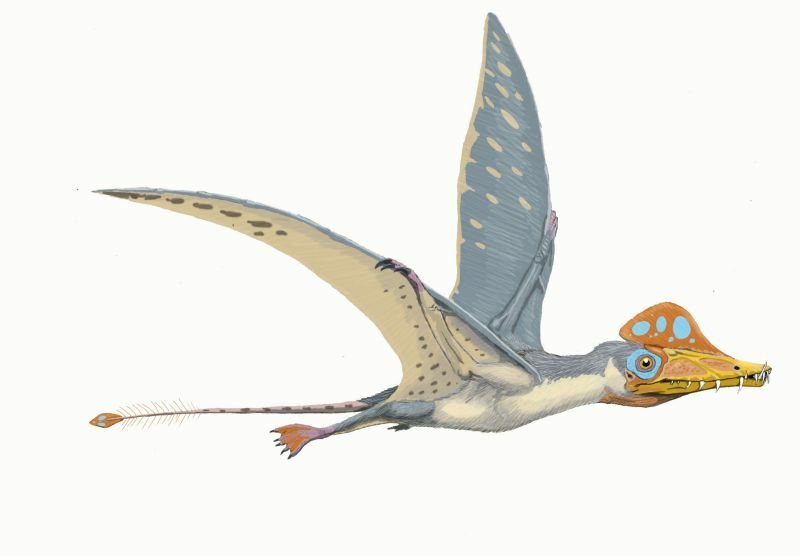 To wit: The Rhamphorhynchoid Pterosaur Scaphognathus crassirostris: A "Living Fossil" Until the 17th Century, written by John Goertzen with the intention of discrediting evolutionary theory. A recent post in the Vintage Dinosaur Art series dealt with the evolving representations of Scaphognathus, which I described as being somewhat less than notable, as pterosaurs go. I ran across this paper while putting together the post, and I couldn't resist digging into it and seeing the evidence presented. Before that, though, it's probably a good idea to lay out the materials from which Goertzen's argument is built. Working with specialists in other disciplines, paleocryptozoologists could integrate the artistic record with the ancient texts and the modern excavation techniques to determine (1) whether individual or combined features from prehistoric fossils were used as models, or (2) whether "living fossils" might have been observed in historical times. For a creationist looking to crow about the false dilemma of the living fossil, this paper opens a whole new field to focus on. The Goertzen paper that inspired this post, as well as other writings of his, appear on a site called "Revolution Against Evolution," so it's a good example of cryptozoology as a weapon in the creationist arsenal. Creationists would do well to realize that a lie (more charitably, a mistake) doesn't become true with repetition. Darwin's theory of evolution by natural selection does not depend on the fossil record, and the more fully fleshed out modern evolutionary theory certainly doesn't. Either evolution deniers understand the science poorly, or they deliberately misrepresent it. Neither option is commendable. Despite all of the noise surrounding this issue, I have to admit: if given my choice of pseudosciences to grant credibility, I'd be tempted to pick this one (though the potential global benefits of free energy would tug at my altruistic streak). It's in this spirit that I weigh stories of cryptids: hopeful that they might be factual, but bound by the tried-and-true, hard-won methods of science and discouraged by a long history of shabby evidence. Tomorrow, in the second half of this post, we'll get into the nitty gritty of this article and see if Goertzen presents compelling evidence to support the hypothesis that Scaphognathus crassirostris survived long enough for observations of it to have been recorded during human history. Is this Zdeněk Burian painting plausible after all? Painting by Zdeněk Burian. Shared by Better than Bad at Flickr. VDA: The Fantastic Four's Mesozoic Mambo! I love comics. I think superhero comics are pretty cool, too, but I am not what you would call a connoisseur of the subgenre. My knowledge of the X-Men, for example, stems mainly from the '90s cartoon series and the recent string of movies. I have a general knowledge of most of the big superheroes, thanks in large part to Wikipedia, but I find myself overwhelmed by the twisting, fragmenting storylines most of them have been a part of over the decades. That's the case for the Fantastic Four, though I've always appreciated them. In today's second Vintage Dinosaur Art Post, the Fantastic Four meet with a host of Mesozoic monsters in a story written and drawn by Walt Simonson. Why two posts today? Can we chalk it up to the extreme generosity of your loving bloggers rather than miscommunication? Fantastic Four 345, published in October 1990, begins with the heroes, accompanied by Sharon Ventura, "The She-Thing," skipping through time on Reed Richards' time sled. Over their adventures, the Fantastic Four have lost their powers. Their trip back to the time they call home is interrupted by some sort of storm in time, which causes them to crash land on a jungle island. Soon, they meet a US Army detachment, which arrived on the island a mere six hours prior. The somewhat less fantastic Fantastic Four try to persuade the soldiers that they are who they say they are, but the argument is interrupted... by a rampaging Spinosaurus! After Ben Grimm blows the spinosaur's brains out with a rocket pistol, the rest of the comic consists of the Fantastic Four and the Army trying to find shelter and not get killed by dinosaurs. Throughout, we're treated to a refreshingly post-renaissance cast of saurian villains. It's refreshing to see that Simonsen was up to speed with the new vision of dinosaur life. Though these animals are definitely monsters, they're not the brainless brutes of atomic age B-Movies. Deinonychus even has feathers, as shown on this page in which a pack of them charge a bany Mamenchisaurus. Luckily for readers not as schooled in paleontology Reed Richards provides play-by-play. After the heroes bunk down (and Ben Grimm gets lucky with Sharon Ventura), the camp is invaded by a stampeding Triceratops. But a fortunately mostly-naked Reed Richards is on the case, running around in his skivvies and using his Fantastic Four uniform to persuade the angry Trike away from camp. Reed Richards in his Hanes doesn't scare off the Deinonychus pack, however, and a poor soldier named Flattop is the victim of a brutal assault. It looks like a losing battle as the team and the boys in uniform are surrounded by snarling raptors. That's when Ben Grimm, wearing his amazing Thing suit, enters the fray. It is now, verily, clobberin' time. He makes short work of the depraved dromaeosaurs. Simonsen engages in a bit of Crichtonian speculative anatomy, giving Deinonychus a detachable tail. The issue ends with a promise of "even bigger dinosaurs, even deadlier peril," and I'd love to get my hands on issue 346. If you've got it, and don't mind scanning it, share it with the Vintage Dinosaur Art pool, won't you? 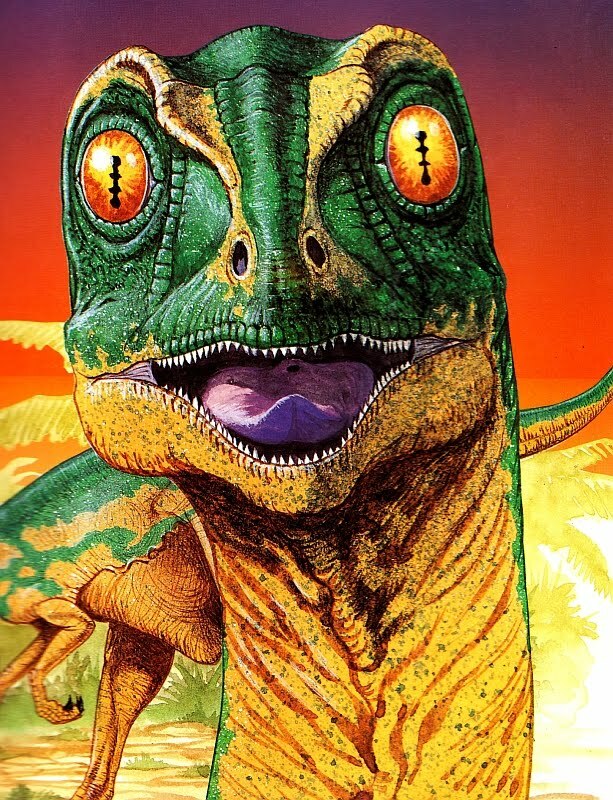 Vintage Dinosaur Art: More Dinosaurs! 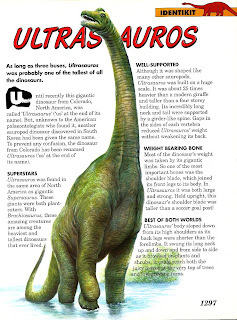 Keen followers of this blog (who surely number into the hundreds of thousands at least by now) may remember that, back in May, I took a look at the first issue of Dinosaurs! magazine from back in the early '90s. However, with all 104 issues at my disposal, it seemed a shame to stop there. Here, then, are 8 more images from throughout the history of the magazine, naturally selected for dino-nerd-entertainment value (rather than artistry. I'm just not fair). Going back to issue 3, as I didn't wish to open with an incomplete image: here we have a classic battle between Allosaurus and Stegosaurus by artist Tony Gibbons. Unfortunately neither of them look convincingly like the real thing, with Allosaurus coming off somewhat worse; note the generic head, tiny hands, enormous scales, and uncomfortably-positioned leg. Still, it could be worse - Stegosaurus' left foot appears to have become detached from its body. Whoops. 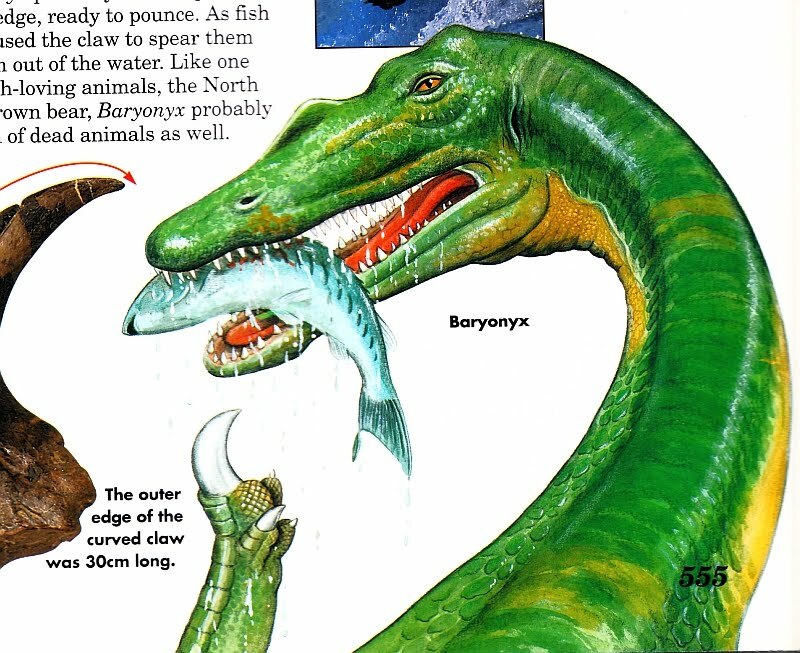 From issue 24: Baryonyx is one of the most famous British dinosaurs, with its long jaws, single midline crest and stumpy, four-fingered hand with three atrophied digits being instantly recognisable. Wait, what? I love how suave it looks, too. A spinosaur with class. Speaking of spinosaurs, issue 29 profiled Spinosaurus itself, and as was de rigueur back in the early '90s (see also: Inside Dinosaurs) it had a 'carnosaur' head and four fingers, as in the below illustration by Barry Croucher. Except when, as on the front cover and centre spread, it had three. Consistency was not Spinosaurus' strong point. Below: Saurornithoides as nightmare fuel. Don't look into the eyes. Don't look into the eyes. Don't look into the eyes. I still absolutely adore the 'History in Pictures' cartoons, detailing episodes from the history of palaeontology. The below image is an excerpt from the first part of 'The Bone Wars', chronicling the rivalry between Cope and Marsh. I think the expressions on their faces when Marsh mocks Cope for his Elasmosaurus error are just fantastic; Cope looks utterly horrified, while Marsh looks like a sneering Bond villain. Wonderful stuff. Finally, two pages that just haven't stood the test of time at all. 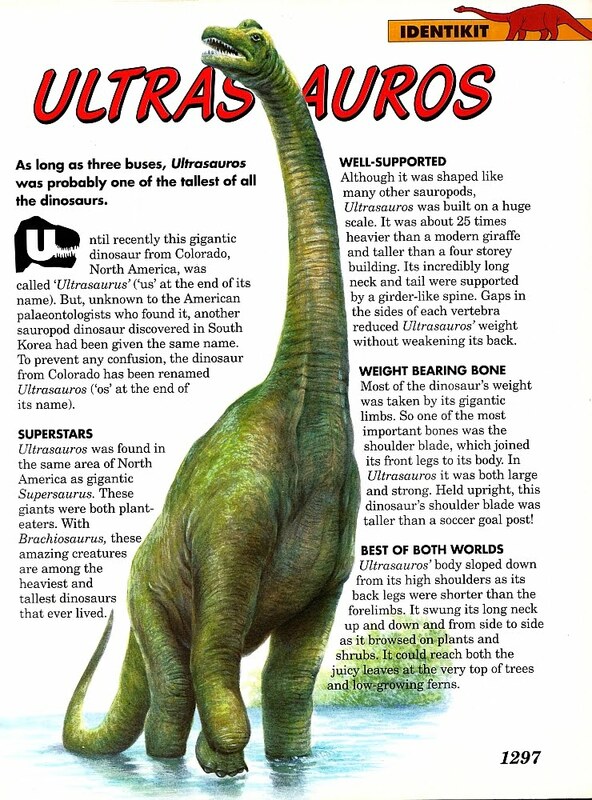 Issue 55 profiled "Ultrasauros", trumpeted as being "among the heaviest and tallest dinosaurs that ever lived", "taller than a four storey building", etc. etc. Illustrations depicted a green Giraffatitan-like behemoth, so incomprehensibly Brobdingnagian that it shrank the little palaeontologist used in the scale diagram to the extent that he was barely visible. A shame, then, that it turned out that "Ultrasauros" didn't exist at all - it was a chimera composed of Supersaurus bits and a big, but not THAT big brachiosaur scapulacoracoid (see this entry at SV-POW). 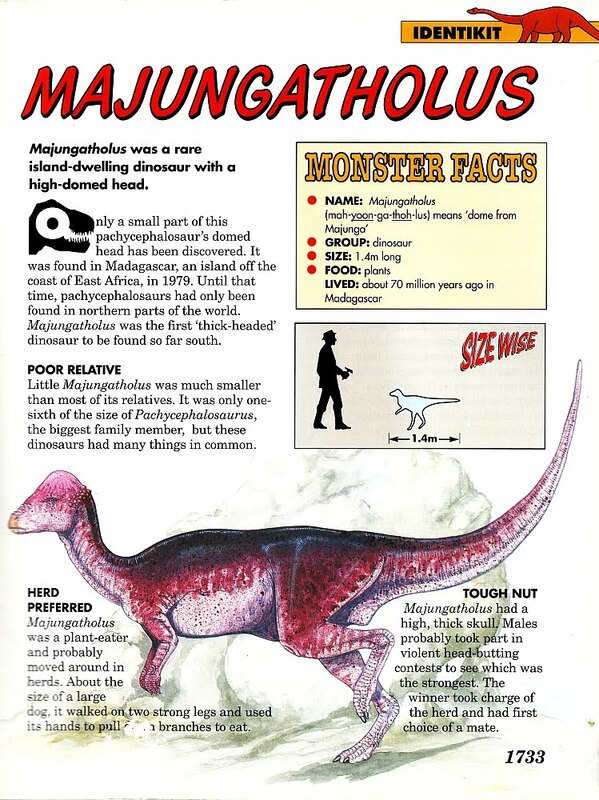 The profile of "Majungatholus", the tiny pachycephalosaur from Madagascar, is just downright funny - you'll probably know it better as the abelisaur Majungasaurus. 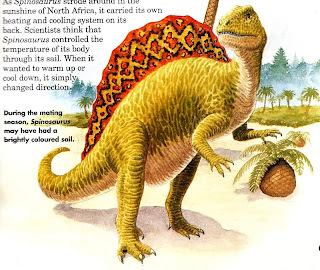 They weren't to know, they weren't to know...and hey, that's not a bad illustration of a generic pachycephalosaur by artist Graham Rosewarne.